Hirokazu Kanazawa is the renowned karate master in the world today, and a close disciple of Gichin Funakoshi, the father of modern karate and founder of the Shotokan School. Having earned his impressive reputation in Hawaii, the mainland United States, and Europe as an official trainer for the Japan Karate Association, Kanazawa founded Shotokan Karate-do International Federation in 1979. This association now has branches in more than 90 countries throughout the world. 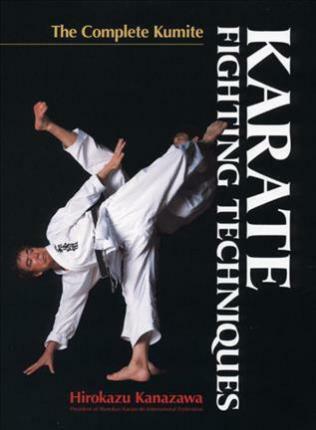 This book is Kanazawa's first complete guide to kumite, or sparring. The karate training process comprises four areas: basics, kata (forms; prearranged movements and techniques), kumite, and competition. Kumite-"the art of grappling with opponents," as it might be called-is the application of kata, and is the key to success in karate tournaments. Karate Fighting Techniques teaches all the various kumite techniques, and presents a systematic approach to applied kumite that is designed to provide essnetial information for match-style kumite and tournament kumite. The author also writes with great affection of his experiences with Master Gichin Funakoshi, and offers some insight into the true spirit and teachings of Shotokan karate. With 700 photos of the author, his students, and some rare photos of the late Gichin Funakoshi and his famous disciple Masatoshi Nakayama (author of the popular Best Karate series), Karate Fighting Techniques is the first book of its kind to provide such a comprehensive guide to kumite and its role in Shotokan karate. It will be an indispensable resource for all karate practitioners. HIROKAZU KANAZAWA, president of Shotokan Karate-do International Federation, carries on the spirit and techniques of his teacher, Gichin Funakoshi. Born in 1931 in Iwate prefecture, Japan, Mr. Kanazawa began practicing karate as a student at Takushoku University and, after graduation, became an instructor for the Japan Karate Association. He has earned many titles in competition, winning first place in kumite at the first Japan Karate Championship in 1957, and taking top honors in both kumite and kata the following year at the second Japan Karate Championship. His long career as a chief instructor dates back to 1960, when he was invited to teach in Hawaii. He has also taught elsewhere in the United States and throughout Europe. In 1979, he founded Shotokan Karate-do International Federation, which now has branches in over 90 countries. Mr. Kanazawa is the author of Karate-My Life and several books in Japanese on karate. RICHARD BERGER was born in Rochester, New York, in 1963 and began training in Shotokan karate in 1982 while attending university in Southern California. He moved to Tokyo in 1990 and has been training at SKIF headquarters since 1993.